Run a mobile poll for live events and other business needs . Get fast, hands-on feedback from your customer base. Consult your bread and butter on decisions which can affect your business!Polls are easy to create and consumers enjoy participating. Use a poll to help your business. Write in your question. What is your favorite sandwich at our restaurant? What kind of event sounds the best to you? Survey the opinions of your customers, get an idea where their heads are at, and use this to your advantage by tweaking concepts, ideas, and/or strategies old and new. 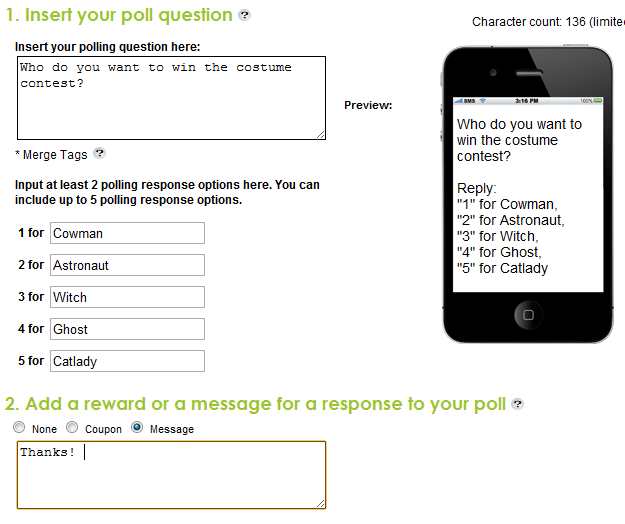 Allocate 2 to 5 responses to polling questions. The user texts a number which corresponds to their response. Upon answering, you have the option to give them a coupon, a message, or nothing in response. The coupon is a great way to reward the customer for providing their opnion, which is invaluable to your business and its goals.